The first C919, a Chinese built commercial aircraft, has taken off on its maiden flight from Shanghai Pudong International Airport. The C919 was developed by the Commercial Aircraft Corporation of China Ltd (COMAC) and features several 3D printed components. The aircraft is the result of many years of research and development and hopes to elevate China as a larger figure in the aviation industry. The twin-engine airliner is anticipated to rival the Airbus A320 and the Boeing 737. The COMAC C919 first unveiled in 2015. Photo via CHEN XIAO/ ASIANEWSPHOTO. The C919 is powered by the LEAP-1C, an engine developed by CFM and famous for its 3D printed fuel nozzle which was certified for use last year. CFM is a joint venture between French company Safran and GE Aviation and their LEAP nozzle is expected to cut emissions by 15%. The LEAP engine nozzles were first 3D printed by Morris Technologies and GE are now working to produce them on the Concept Laser machines acquired as part of last years takeover. Additionally, according to the IDC, the C919 features many 3D printed titanium parts including 28 cabin door parts and two fan inlet parts. 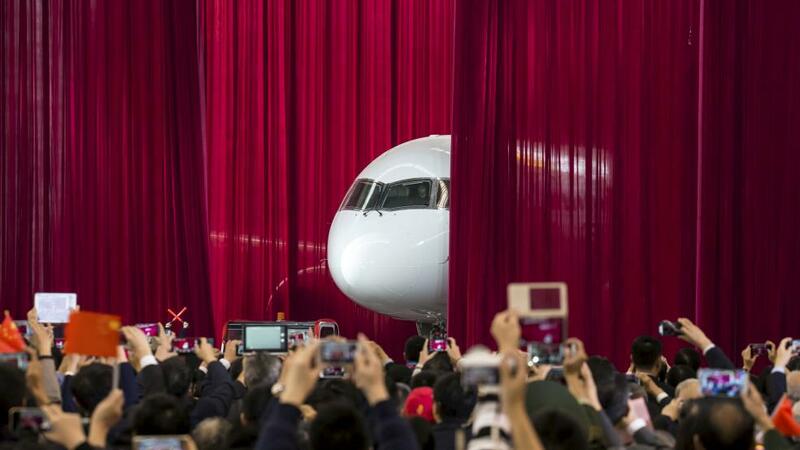 The aircraft is part of China’s mission, ‘Made in China 2025’, to increase the manufacturing output of the country. While many of the additive manufactured components were produced outside of China, COMAC enlisted Xi’an Bright Laser Technologies (BLT) to 3D print some of the metal parts according to the company’s press release. Founded in 2011, BLT is “the largest provider of complete solution for metal additive manufacturing in China.” The company was also recently awarded Enterprise OEM of the year in the 3D Printing Industry Awards. An illustration of some of the foreign suppliers working on the C919. Image via Bloomberg. According to the IDC release, Chinese 3D printing solutions provider FalconTech supplied a total of 30 metal 3D printed parts for the C919. The Chinese manufacturing company reportedly used a number of foreign machines to print the components. 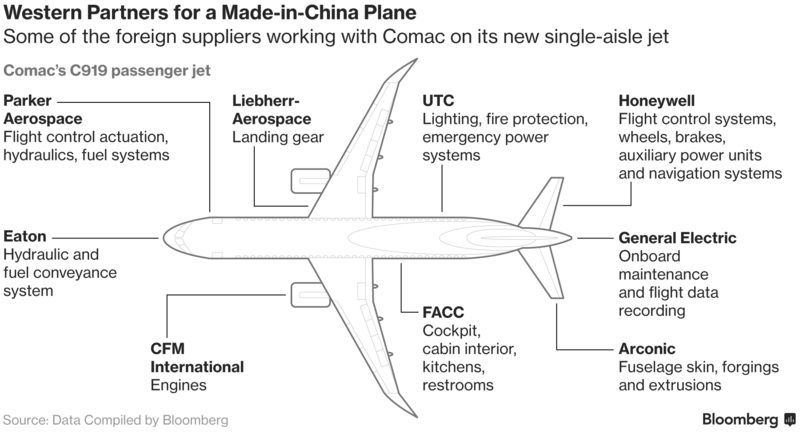 By doing so, COMAC would have been able to accelerate the development process and it seems the organization hopes to get ahead of its competitors by embracing advanced technologies. Following the success of the C919’s development, the Commercial Aircraft Corporation of China will now develop a larger version – the C929 – with Russia’s United Aircraft Corp (UAC). Featured image shows the C919 taking off on its maiden flight. Photo via COMAC.